The Golden Gate Bridge is to the left and Alcatraz is to the right. Oh, the stories they could tell. 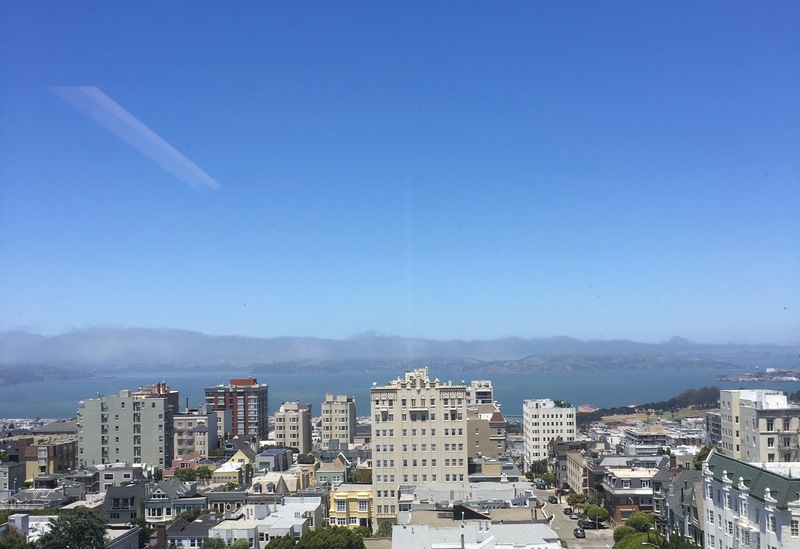 This is my view of San Francisco for the next four days as I participate in a Phase 1 (first time in humans) drug trial. Genentech has been working on the drug GDC-0134 in the lab for over a decade and it looks promising. The study is titled: “A Single-Ascending-Dose Study of GDC-0134 to Determine Initial Safety, Tolerability, and Pharmacokinetic Parameters in Patients with Amyotrophic Lateral Sclerosis.” It’s a randomized, double-blind, placebo controlled study to investigate a new neuron modulator. That’s a mouthful! For my fellow nerds, here’s a link to the study description. My journey with GDC-0134 began last October when I was the “patient face” for Genentech’s grand rounds. This is Genentech’s first time in the ALS space and I was honored to represent the community of patients living with ALS. The team proudly presented its years of work and was anxiously awaiting FDA approval for a new investigational drug. Eight patients nation-wide have participated in the first arm of the study; three more study arms are planned pending review of the initial safety data. There is a long way to go as this is the first step of the clinical trials. Before checking into the hospital, I had two pre-trial appointments chockfull of surveys, blood tests, vitals, EKGs and eye exams. I was admitted into the hospital yesterday and had about a zillion pre-dosing baseline tests. You know how hospital stays go, the nurse took my vitals every two hours through the night. I took the new medication at 8:00 this morning followed by blood draws, vitals, and EKGs every 30 minutes for two hours. Then every hour, now we are down to every two hours. Hopefully Wednesday through Friday will be more restful. Why am I choosing to be a guinea pig? Why am I subjecting myself to weeks of hospital stays and endless needle pricks? If GDC-0134 proves safe and efficacious, it won’t be available for years — I need a treatment now. So why subject myself? Because I can. I have the opportunity to make a difference. Even if I don’t benefit directly, my participation will add to the body of knowledge and get us one step closer to an effective treatment. I can’t do this alone. Thank you for all the love, prayers and support. I don’t want to die. If fact, I’m fighting to live! The End of Life Option Act just became law in California. A patient with six months to live has the option the obtain life-ending medication. Here’s the problem — the medications have to be self administered. By the time most ALS patients have six months to live they are completely paralyzed and do not have access to the End of Life Option. Many are also unable to communicate and can’t make the two verbal requests and one written request required by the law. I was interviewed by our local CBS news affiliate last week and shared how people with ALS and other physically debilitating diseases won’t be able to access the law. Regardless of how you feel about it, it is the law and everyone should have access to it regardless of a disability. Looks like we have some advocacy work to do. Speaking of accessibility and advocacy, why do all forms of public transportation have wheelchair accessibility except airplanes? Anyone know how to make that happen? Do I have to sue the airlines?